July 10, 2013 (LocalOrg) - Make Magazine describes a makerspace as a "gym where you get a membership to use the equipment." That equipment ranges from everything including basic hand and power tools, to machining equipment and 3D printers. Some makerspaces even serve as springboards for DIYbio labs that give the public access to the tools and techniques required to measure, detect, and alter the environment around us on a molecular level. Image: Mackerspaces from top left and going clockwise in Germany, Canada, and Singapore. 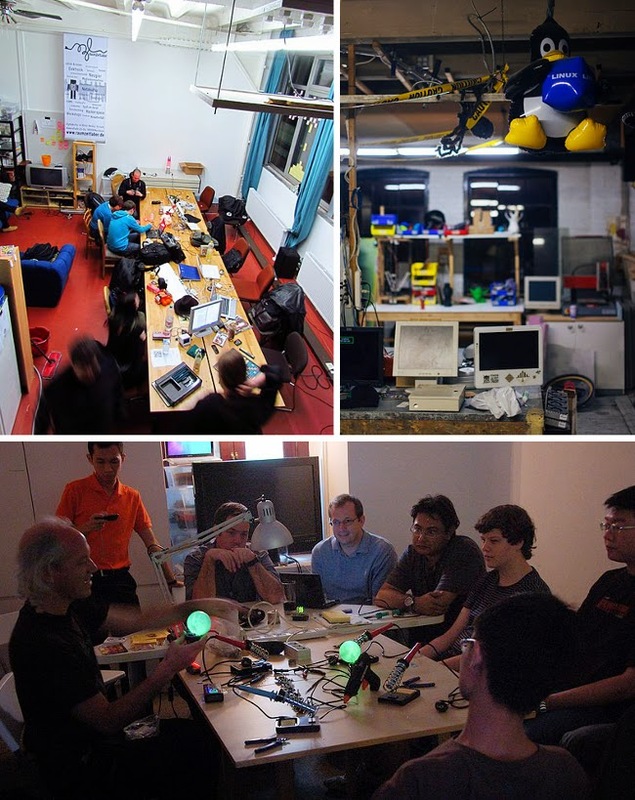 A makerspace starts with basically a table and a group of like minded individuals and just like a personal workspace, evolves over time accumulating tools, knowledge, members, and accomplishments. At first, makerspaces - also known as hackerspaces, techshops, tech centers, and many other names - seemed to be perfect storms of local talent converging and organizing into something impressively novel and innovative. NYC Resistor, for example, served as the foundation from which the now prolific Makerbot rose, as well supporting the creation of one of the most prominent DIYbio labs, Genspace. But what was at first a novelty, has increasingly become a successful art and science - the creation, organization, and expansion of makerspaces and orbiting local institutions from microfactories and design houses, to DIYbio labs. Indeed, a gym is a good analogy to understand makerspaces. Today’s health clubs started out years ago as bodybuilding gyms. They were designed to meet the needs of a narrow, largely male membership. They weren’t particularly friendly to newcomers or casual users. Yet something changed in our culture around physical fitness, and health clubs became more open and accommodating, to broaden membership by welcoming women as well as men, and the serious as well as the casual member. This is what we’re seeing as makerspaces transition from volunteer efforts serving a small group of members. And more and more makerspaces are springing up across America and around the world as the paradigm they've sprung from widens. While the business model aspect of a makerspace can be compared to a health club, the output of a makerspace is quite different. While makerspaces are meeting and workspaces where both business and socialization (and a combination of the two) can occur, they also serve as local educational institutions, SME (small and medium enterprises) incubators, skill training centers, as well as a focal point where communities can gather and collectively pool resources and pragmatically, technologically solve problems. A makerspace can start out with something as simple as a room with a table in it around which friends gather to brainstorm. Tools and small projects can be brought in on a weekly basis as can new members until critical mass is reached either to expand into a permanent location with regular hours, or formalize the structure of these initial meetings into something more resembling an organization. The world of tomorrow is being built now, everyday, with everything we do, say, and pay into in terms of attention, money, effort, and time. We can choose to be passive spectators supporting the ideals and visions of others and their institutions, or we can roll up our sleeves and begin building the world we want to live in tomorrow, with our own two hands today within our own, local institutions. The perfect place to begin is locally, within a growing, technologically literate community, at a makerspace - either one that exists already, or one we will into existence along a now well established and successful model of pragmatism in practice.